Join us the first weekend in December for a Christmas Day in Gettysburg! 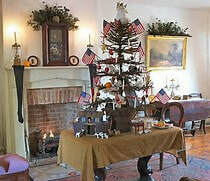 Experience a Civil War Christmas! ​You are cordially invited to take a candlelight tour of the Shriver House Museum decorated for an 1860's Christmas, while hearing the story of the Shriver family and how the Battle of Gettysburg and the civil War changed their lives forever. Tours run on the hour for walk in guests and groups of ten or more are welcome to experience a private tour with reservations. Enjoy the Third Annual Victorian Christmas on Steinwehr Avenue! Visit the Lincoln Train Museum to celebrate our American freedoms & create a Christmas card for our American Soldiers and Veterans who fight for our freedoms. ​Explore Steinwehr Ave. and meet Mr. & Mrs. Clause, enjoy carriage rides and activities for families, discounts & specials, free gift wrap, music, gift raffles & more. Join Gettysburg for the annual Christmas parade at 7:00 p.m. as we sing Christmas carols together and light the tree in the Lincoln Square. Enjoy bands, floats, costumed characters, dancers, youth groups and Santa himself!